Say what you will about the War Between the States aka the Civil War, but they had some awesome tunes. My fave, Stephen Foster, was the Kurt Cobain of the Civil War. Hard Times Come Again No More may well be my favorite song of all time, albeit poignant to the edge of suicidal. 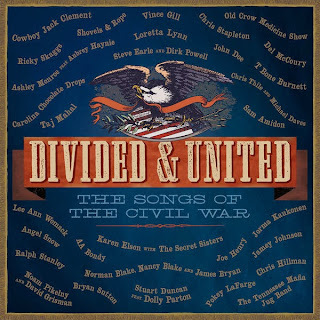 Really, though, one hasn't heard the Civil War in song until one hears the Carolina Chocolate Drops or Pokey LaFarge do the Civil War. Then there are Ralph Stanely and Norman Blake; not to mention Dolly Parton and Loretta Lynn. It is probably a coincidence that Divide & United was released as the Smithsonian is offering up its look at Civil War artifacts in Civil War 360. I may be a bit biased as my friends Kathy Golden and Dave Miller offer a historical perspective on John Singleton Mosby and J.E.B. Stuart while looking at some of their "stuff." Of course the last big rush of Civil War tunes came about when Ken Burns' The Civil War made such a splash on PBS. But that was long before the Old Crow Medicine Show was belting out Marching Through Georgia or Shovels and Rope (a Charleston band we keep hoping will break out big) singing The Fall of Charleston. I know, I know, this may not be your cup of tea or sweet tea, as it were, but if you love a heavy dose of folk-y, funky, Americana, this one is for you.